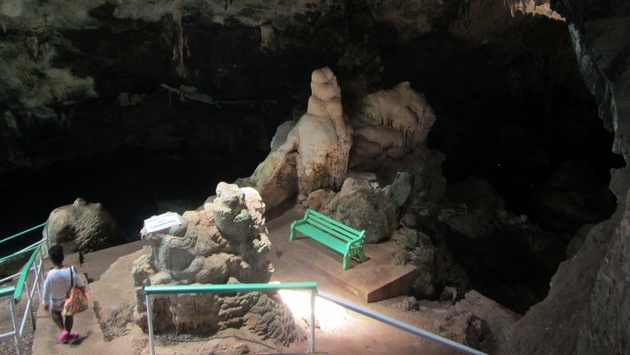 Photo: Travelers in Trinidad can explore Gasparee Caves outside of Port of Spain. (Photo by Brian Major). At times it pays to stray just a bit from the beaten path, even when traveling to familiar warm-weather destinations. Travelers around the world know and love the Caribbean’s blue skies, white sands and golden sunshine, but a handful of the regions’ lesser-visited destinations are now offering fall and winter travel packages via which travelers can experience beyond-the-ordinary attractions, cuisine and culture found in these “alternative” destinations. Trinidad’s Port of Spain is not only the country’s capital, it offers travelers an excellent base from which to journey across the surprising and intriguing island to visit easy-going white-sand beaches, lush national parks and an array of historic monuments. Located just outside of the city, the boutique Kapok Hotel is offering a special fall rate of $167 per night, single or double occupancy, for four-night stays that include a weekend. The rate includes breakfast, Wi-Fi service and roundtrip shuttles to Maracas Beach. Reservations must be made seven days prior to arrival for travel from now through Jan. 15, 2015. Amenities include room service, complimentary Wi-Fi, a self-service laundry, an exercise facility, a swimming pool and two restaurants. Kava, located on the lobby level, features casual dining including artisan brick oven pizzas while Tiki Village, a fine dining Asian restaurant located on the hotel’s eighth floor, offers panoramic views of Port of Spain. The hotel is within strolling distance of Queen's Park Savannah, home to Trinidad's Carnival, considered the Caribbean’s preeminent Lenten celebration. The property is also located near attractions including the President's House and Botanical Gardens, and excursions are available to Trinidad’s natural attractions, from its bamboo forest to the Gasparee Caves located on the Chaguaramas peninsula off the northwestern shore, 20 minutes from Port of Spain’s cruise ship complex. Technically Bermuda is not in the Caribbean and it’s also not exactly new to travelers. The North Atlantic archipelago in fact enjoyed an authentic heyday as a warm-weather getaway as recently as the 1970s and 1980s. However Bermuda may be new to many of today’s travelers, as the destination seeks to re-energize its tourist arrival numbers. In fact the resurgence does appear to be underway as several of its classic hotel properties are being renewed. The same resorts are offering special deals to re-introduce travelers to their offerings. For example Bermuda’s Fairmont Hamilton Princess and Fairmont Southampton hotels are each offering a fall/winter promotion featuring one free night for every three booked for reservations made through Dec. 31, 2015. The offer applies to travel from now through March 31, 2015 and from Sept. 7 to Dec. 31, 2015. The classic Bermuda sister properties have each undergone significant renovations. Fairmont Hamilton Princess recently completed the first phase of a $90 million restoration designed to “maintain the historic character of the hotel, while creating a luxury urban resort.” The property now features a new infinity pool, renovated rooms and suites in the Poinciana and Bermudiana wings, and a marina with a bar and restaurant overlooking the harbor. The second phase of the renovation will include new guest rooms in the main building, extensive renovations of the hotel grounds and a new restaurant operated by celebrity chef Marcus Samuelsson. At the Fairmont Southampton, the first phase of an $11.5 million renovation of 230 guest accommodations has been completed. An additional 172 rooms will be renovated this winter. Another recently revitalized property, Elbow Beach Bermuda Resort, is featuring a “Fourth Night Free” promotion for travelers in search of quick fall getaways. Under the offer guests who book an Elbow Beach stay through Nov. 30, 2014 will receive a fourth night free on any stay three nights or longer. A fabled name among Bermuda hotels, Elbow Beach re-opened earlier this year an independent resort, with the goal of re-establishing the deluxe accommodations and hospitality that distinguished its predecessor. The hotel’s original version opened as Bermuda’s first lodging property in 1908, and today’s property features luxury accommodations and services, plus an unmatched location on Bermuda’s South Shore beach. A variety of fall and winter packages are also available at luxurious Caribbean villas located in several of the Caribbean’s lesser-visited but experience-rich smaller islands. Beaches Edge Anguilla is offering $1,000 off stays of five nights or more at one — or both — of its two five-bedroom villas during the Thanksgiving holiday period. Between Nov. 22 and 30, 2014, travelers can rent one five-bedroom, five and one-half bath villa for up to 10 people. Or, vacationers can book the property’s east and west villas for a combined 10 bedrooms sleeping up to 20 people. The villas are located near Anguilla’s West End and overlook Pelican Bay. Guests have access to a secluded beach accessed by a footpath next to the villas. The villas include daily housekeeping and concierge services, in-villa massage services, personal chefs, childcare, wine and grocery stocking, golf, fitness instruction and excursions. Each villa is equipped with a private pool, balcony, terrace, en-suite bath, full kitchen, outdoor grill, central air conditioning, flat-screen TVs and Internet service. The Plantation Beach Villas on the tiny island of Tobago is offering a “Stay for Seven, Pay for Five” promotion valid for reservations made by Nov. 21, 2014. The offer applies to travel from September 1 through Nov. 30, 2014. Set on a hillside framed by tropical trees that overlooks a white-sand Stonehaven Bay beach, the property offers six villas outfitted with modern amenities and equipped with spacious teak verandas. Guests will receive a welcome package featuring a fresh fruit basket, cold beers, soft drinks and milk. Guests who reserve a local rental car for seven days will receive one day free.